, Earl Of Bath, an eminent English statesman, was descended from an ancient family, who took their surname from a place of that appellation in Leicestershire. His grandfather, sir William Pulteney, was member of parliament for the city of Westminster, and highly distinguished himself in the House of Commons by his manly and spirited eloquence. Of his father, little is upon record. He was born in 1682, and educated at Westminster school and Christ-church, Oxford, where his talents and industry became so conspicuous, that dean Aldrich appointed him to make the congratulatory speech to queen Anne, on her visit to the college. Having travelled through various parts of Europe, he returned to his riative country with a mind highly improved, and came into parliament for the borough of Heydon in Yorkshire, by the interest of Mr. Guy, his protector and great benefactor, who left him 40,000l. and an estate of 500l. a year. Being descended from a whig family, and educated in revolution-principles, he warmly espoused that party, and during the whole reign of queen Anne opposed the measures of the tories. His first speech was in support of the place-bill. He had formed a notion, that no young member ought to press into public notice with too much forwardness, and fatigue the House with long orations, until he had acquired the habit of order and precision. He was often heard to declare, that hardly any person ever became | a good orator, who began with making a set speech. He conceived that the circumstances of the moment should impel them to the delivery of sentiments, which should derive their tenor and application from the course of the debate, and not be the result of previous study or invariable arrangement. These rules are generally good, but we can recollect at least one splendid exception. On the prosecution of Dr. Sacheverel, Mr. Pulteney distinguished himself in the House of Commons, in defence of the revolution, against the doctrines of passive obedience and nonresistance. When the tories came into power, in 1710, he was so obnoxious to them, thathis uncle, John Pulteney, was removed from the board of trade. He not only took a principal share in the debates of the four last years of queen Anne, while the whigs were in opposition, but was also admitted into the most important secrets of his party, at that critical time, when the succession of the Hanover family being supposed to be in danger, its friends engaged in very bold enterprizes to secure it. He was a liberal subscriber to a very unprofitable and hazardous loan, then secretly negociated by the whig party, for the use of the emperor, to encourage him to refuse co-operating with the tory administration in making the peace of Utrecht. 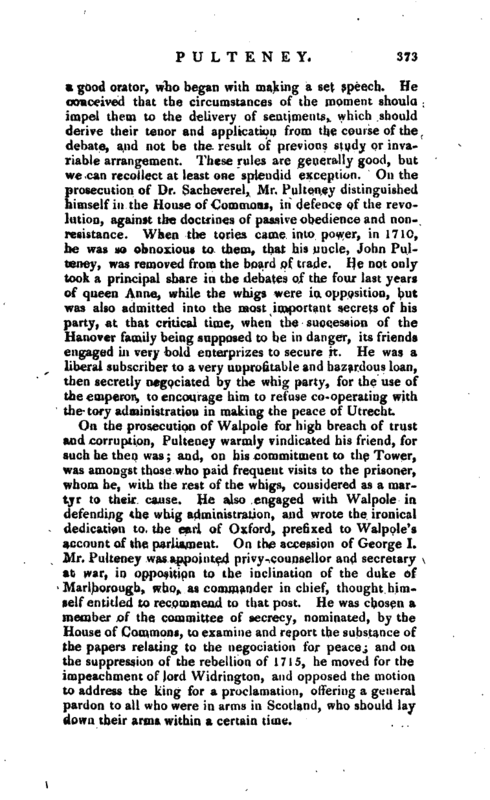 On the prosecution of Walpole for high breach of trust and corruption, Pulteney warmly vindicated his friend, for such he then was; and, on his commitment to the Tower, was amongst those who paid frequent visits to the prisoner, whom he, with the rest of the whigs, considered as a martyr to their cause. He also engaged with Walpole in defending the whig administration, and wrote the ironical dedication to the earl of Oxford, prefixed to Walpole‘ s account of the parliament. On the accession of George I. Mr. Pulteney was appointed privy-counsellor and secretary at war, in opposition to the inclination of the duke of Marlborough, who, as commander in chief, thought himself entitled to recommend to that post. He was chosen a member of the committee of secrecy, nominated, by the House of Commons, to examine and report the substance of the papers relating to the negociation for peace; and on. the suppression of the rebellion of 1715, he moved for the impeachment of lord Widrington, and opposed the motion to address the king for a proclamation, offering a general pardon to all who were in arms in Scotland, who should lay down their arms within a certain time. | He was at this period so much connected with Stanhope and Walpole, that, in allusion to the triple alliance between Great Britain, France, and Holland, which was then negociating by general Stanhope, secretary of state, they were called the three “grand allies;” and a proverbial saying was current, “Are you come into the triple alliance?” But when Stanhope and Walpole took different sides, on the schism between the whigs, when Townsend was dismissed and Walpole resigned, Pulteney followed his friend’s example, and gave up his place of secretary at war. When Walpole made a reconciliation between the king and the prince of Wales, and negociated with Sunderland to form a new administration, in which he and lord Townsend bore the most conspicuous part, then were first sown those seeds of disgust and discontent which afterwards burst forth. The causes of this unfortunate misunderstanding may be traced from the authority of the parties themselves, or their particular friends. 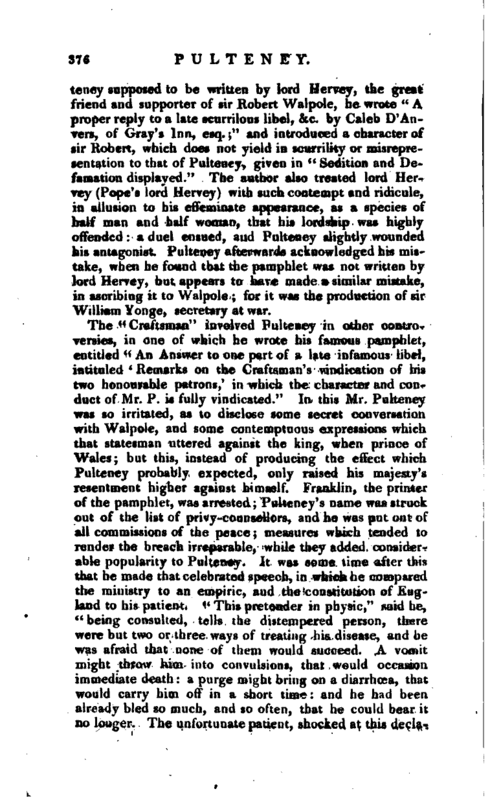 Pulteney was offended because Walpole had negociated with the prince of Wales and Sunderland, without communicating the progress to him, although he had told it to Mr. Edgcumbe, who indiscreetly gave a daily account to Pulteney. 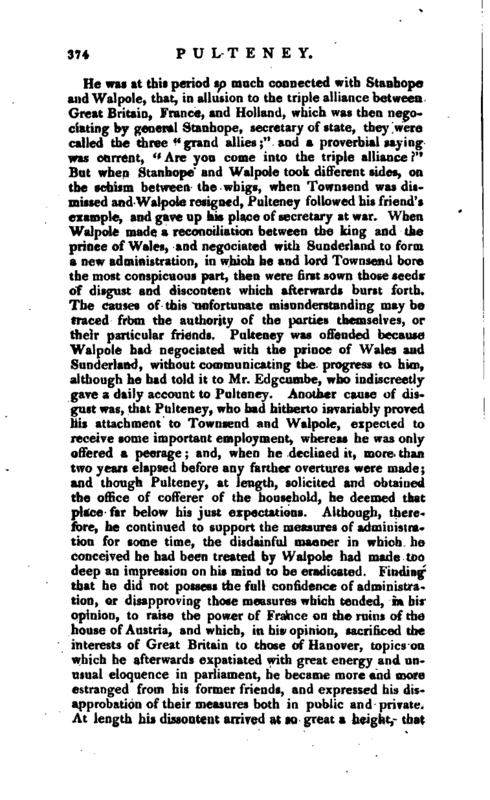 Another cause of disgust was, that Pulteney, who had hitherto invariably proved his attachment to Townsend and Walpole, expected to receive some important employment, whereas he was only offered a peerage; and, when he declined it, more than two years elapsed before any farther overtures were made; and though Pulteney, at length, solicited and obtained the office of cofferer of the household, he deemed that place far below his just expectations. Although, therefore, he continued to support the measures of administration for some time, the disdainful manner in which he conceived he had been treated by Walpole had made too deep an impression on his mind to be eradicated. Finding that he did not possess the full confidence of administration, or disapproving those measures which tended, in his opinion, to raise the power of France on the ruins of the house of Austria, and which, in his opinion, sacrificed the interests of Great Britain to those of Hanover, topics on which he afterwards expatiated with great energy and unusual eloquence in parliament, he became more and more estranged from his former friends, and expressed his disapprobation of their measures both in public and private. At length his dissontent arrived at so great a height, that | he declared his resolution of attacking the minister in parliament. 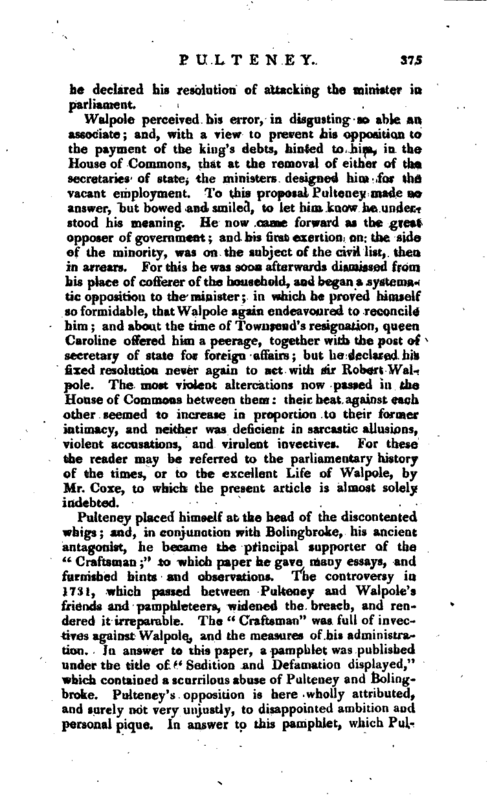 Walpole perceived his error, in disgusting so able an associate; and, with a view to prevent his opposition to the payment of the king’s debts, hinted to him, in the House of Commons, that at the removal of either of the secretaries of state, the ministers designed him for the vacant employment. To this proposal Pulteney made no answer, but bowed and smiled, to let him know he under* stood his meaning. He now came forward as the great opposer of government; and his first exertion on the side of the minority, was on the subject of the civil list, then in arrears. For this he was soon afterwards dismissed from his place of cofferer of the household, and began a systematic opposition to the minister; in which he proved himself so formidable, that Walpole again endeavoured to reconcile him; and about the time of Townsend’s resignation, queen Caroline offered him a peerage, together with the post of secretary of state for foreign affairs; but he declared his fixed resolution never again to act with sir Robert Walpole. The most violent altercations now passed in the House of Commons between them: their heat against each other seemed to increase, in proportion to their former intimacy, and neither was deficient in sarcastic allusions, violent accusations, and virulent invectives. For these the reader may be referred to the parliamentary history of the times, or to the excellent Life of Walpole, by Mr. Coxe, to which the present article is almost solely indebted. Pulteney placed himself at the head of the discontented whigs; and, in conjunction with Bolingbroke, his ancient antagonist, he became the principal supporter of the “Craftsman” to which paper he gave many essays, and furnished hints and observations. The controversy in 1731, which passed between Pulteney and Walpole’ s friends and pamphleteers, widened the breach, and rendered it irreparable. The “Craftsman” was full of invectives against Walpole, and the measures of his administration. Jn answer to this paper, a pamphlet was published under the title of “Sedition and Defamation displayed,” which contained a scurrilous abuse of Pulteney and Bolingbroke. Pulteney’s opposition is here wholly attributed, and surely not very unjustly, to disappointed ambition and personal pique. In answer to this pamphlet, which | Pulteney supposed to be written by lord Hervey, the great friend and supporter of sir Robert Walpole, he wrote “A proper reply to a late scurrilous libel, &c. by Caleb D’Anvers, of Gray’s Inn, esq. 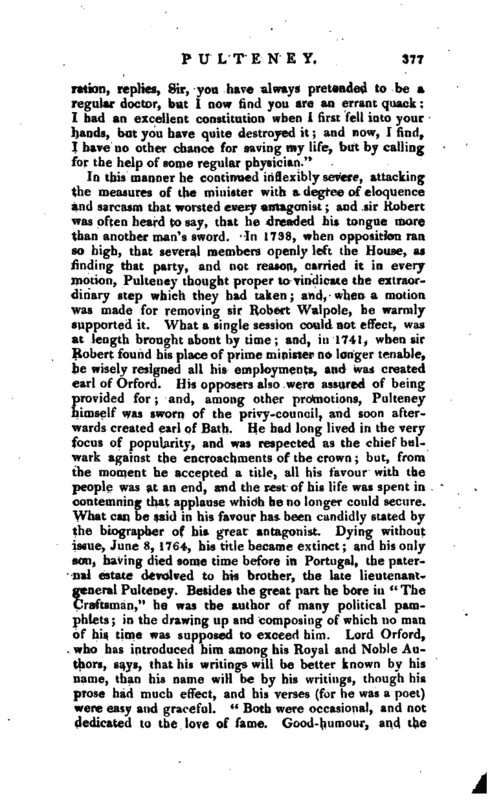 ;” and introduced a character of sir Robert, which does not yield in scurrility or misrepresentation to that of Pulteney, given in “Sedition and Defamation displayed.” The author also treated lord Hervey (Pope’s lord Hervey) with such contempt and ridicule, in allusion to his effeminate appearance, as a, species of half man and half woman, that his lordship was highly offended: a duel ensued, and Pulteney slightly wounded his antagonist. Pulteney afterwards acknowledged his mistake, when he found that the pamphlet was not written by lord Hervey, but appears to have made a similar mistake in ascribing it to Walpole; for it was the production of sir William Yonge, secretary at war. 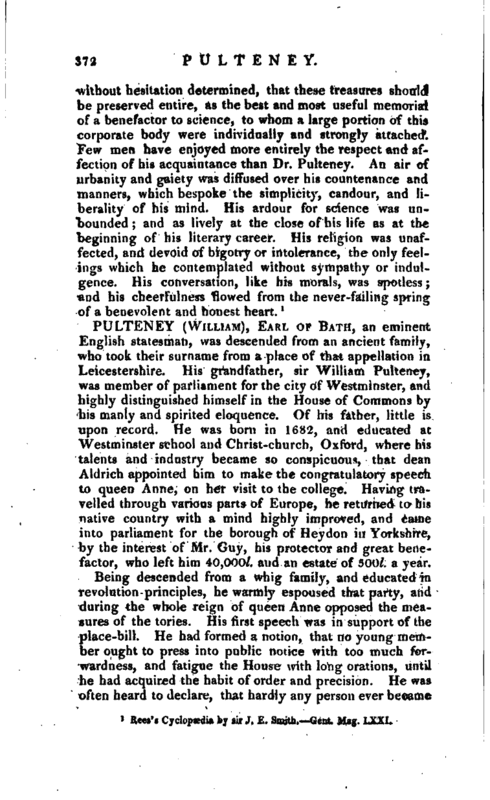 The “Craftsman” involved Pulteney in other controversies, in one of which he wrote his famous pamphlet, entitled “An Answer to one part of a late infamous libel, intituled ‘ Remarks on the Craftsman’s vindication of his two honourable patrons,’ in which the character and conduct of Mr. P. is fully vindicated.” In this Mr. Pulteney was so irritated, as to disclose some secret conversation with Walpole, and some contemptuous expressions which that statesman uttered against the king, when prince of Wales; but this, instead of producing the effect which Pulteney probably expected, only raised his majesty’s resentment higher against himself. Franklin, the printer of the pamphlet, was arrested; Pulteney’s name was struck out of the list of privy-counsellors, and he was put out of all commissions of the peace; measures which tended to render the breach irreparable, while they added considerable popularity to Pulteney, It was some time after this that he made that celebrated speech, in which he compared the ministry to an empiric, and the constitution of England to his patient. This pretender in physic,“said he,” being consulted, tells the distempered person, there were but two or three ways of treating his disease, and be was afraid that none of them would succeed. A vomit might throw him into convulsions, that would occasion immediate death: a purge might bring on a diarrhoea, that would carry him off in a short time: and he had been already bled so much, and so often, that he could bear it no longer. The unfortunate patient, shocked at this decla-, | ration, replies, Sir, you have always pretended to be a regular doctor, but I now find you are an errant quack,: I had an excellent constitution when I first fell into your hands, but you have quite destroyed it; and now, I find, I have no other chance for saving my life, but by calling for the help of some regular physician." How many Martials were in Pultney lost! 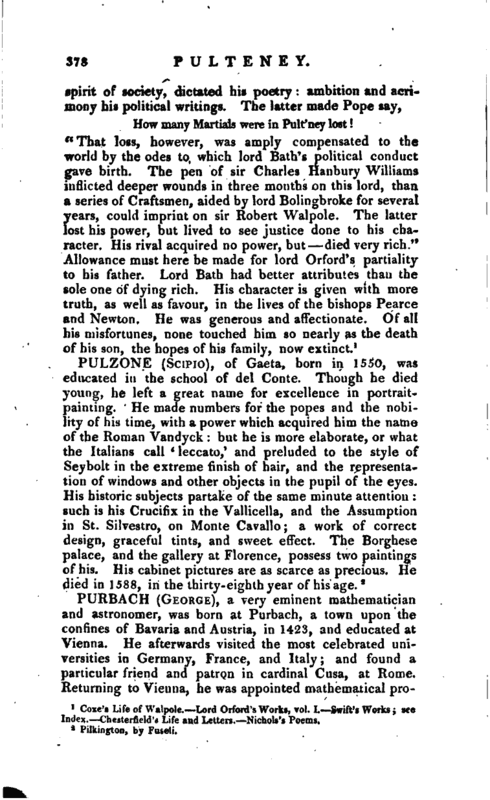 Coxe’s Life of Walpole. Lord Orford’s Works, vol. I. -Swift’s Works see Index. Chesterfield’s Life and Letters. Nichols’s Poems.